When all the stars align and you get the chance to run off with your husband for a few days, do it! This great idea occurred to us in July, deep in the heart of bickering season – aka summer break. We needed exactly that, a break. We looked at our schedules and budget. It didn’t take long to determine a cruise to be the best fit. And it wasn’t just any cruise we booked. It was a Disney cruise and the kids were mad! Why would we do a kid-free vacation in such a kid-saturated area? The truth is we’re suckers for the travel experience the Disney company has always provided. I pulled together every piece of emergency contact information I could imagine. I wrote out schedules, menus, and generally helpful tips. I got cash, left behind a health insurance card, and said many prayers. It came with tears, but on a Sunday afternoon we left our girls in the care of my amazing mother and found myself heading towards Port Canaveral, FL with my husband. Only my husband. The next day we boarded the boat and began the chore of relaxing and spending time together without the distraction of our children. It was heavenly. Now that we’ve had some time to reflect, I asked him what his five favorite things were about the trip. Here’s what he said. No cell phone – This man’s phone is always pinging with texts, emails, calls, and voice mails. I doubted him when he said he was planning to turn it off for several days. I stand corrected (and impressed) as it was off from Sunday to Saturday. It was beautiful. No news coverage – From Ebola to your favorite college team losing a game, rarely does the news do anything but bring you down. We intentionally took a break from that. People bringing us drinks – For once it was wonderful to not be serving others. Snorkeling and martini tasting – We spent a day out in the open ocean off the coast of a small Bahamian island looking at tropical fish. It was fantastic! Later that day we learned all about martinis and drank even more. He listed these two events because it was fun to do something new together. Both were a change of pace and totally unlike a typical day. Watching “Monsters Inc.” on the huge screen – Why would you watch a Disney movie when there are no kids controlling the remote? Because we could. When I think about the trip, here are my favorite memories. No schedule – I can’t tell you how many times I pondered what time it was with zero estimation. I refused to wear a watch or carry my cell phone. We relied on others to tell us. No cooking – I don’t mind cooking, but it gets tiresome. It was awesome to enjoy new food that I didn’t have to spend a minute planning, shopping for, or preparing. Time to do as much or as little as we wanted – We read books. We went swimming. We stared blankly at the water. My brain was uncluttered with everyday life and that was magical. We indulged – Too much to eat, too much to drink, too much sun, too much sleep. We kept it light – We deliberately didn’t talk about the heavy stuff. When chat about work, kids, home, or any other deep topic got too involved, we stopped ourselves. It would all be there when we got back, so we pressed the pause button and got another ice cream cone. Our trip was exactly what we needed. 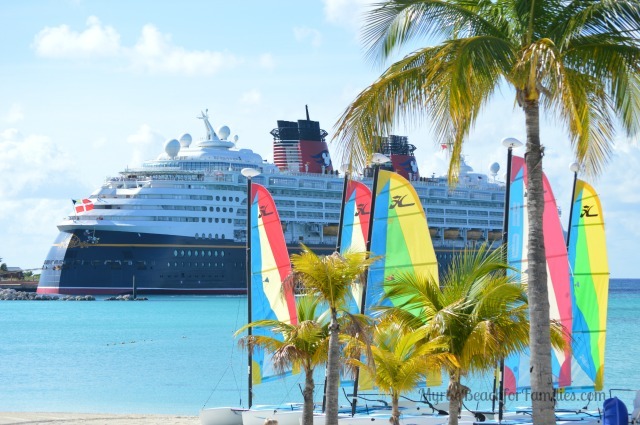 Seriously, everything good you heard about a Disney cruise is true. Though I feel like a couple can enjoy each other and get a break from the kids anywhere that makes them happy. While it’s hard to get away (Trust me, I know. This is only the second time since I became a mother), it’s worth it. When it was time for us to head back up I95, I was ready. We had a great time and I was refreshed, but I missed the kids…and the dog. If you get the chance to take a kid-free trip, take it. You owe it to yourself and your partner in parenting. You both deserve it! This article originally appeared in Parent News. Last year I made a resolution to spend more time with my husband. This is the first in a series of posts about our Disney cruise on the Wonder. Click here to see the rest of the series. This is great timing for us. Heidi and I will have our 10 year anniversary in 2015 and we are planning our trip. One of the things we talked about was a Disney Cruise, but a much debated topic is weather to bring the kids along. Looking forward to the future post.